Barneys New York has a great blog called B-Sides. A few weeks before my vacation I discovered the brand Le Labo from New York on the B-Sides blog. Le Labo is a fragrance company sold at Barneys. The company's concept sounded really interesting, and when I finally got a chance to visit a Barneys, I decided to test it out. 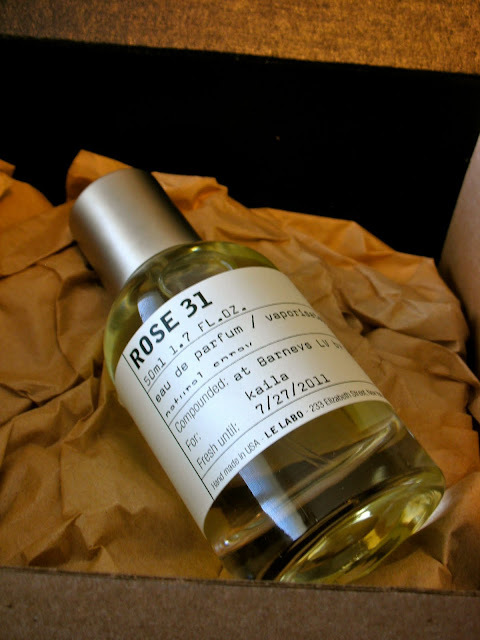 I instantly loved the scent Rose 31. It's a feminine/masculine rose scent that is warm and spicy. The neat thing about this perfume is that it is made ready-to-order. They made my perfume right in front of me, and even personalized the label with my name! Wow, that's such a cool idea! now that is definitely a scent all your own!